RecipeSavants.com Anise perks up the regular biscotti! Wonderful with fruit, these crisp slices make a brilliant partner for grilled vegetable salad and Vienna Lager. 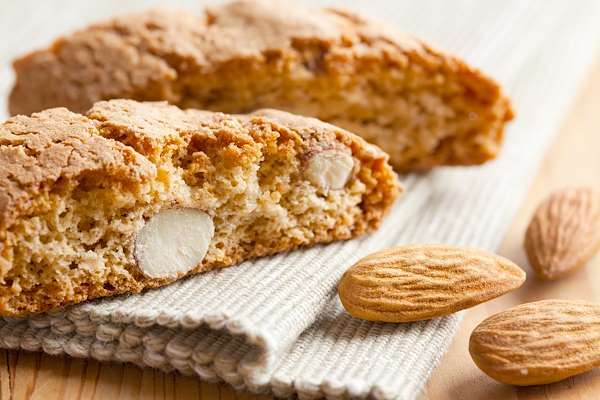 Smart Recipes, American Recipes, Eggs,Grains Recipes, Recipes Eggs,Grains American Almond Biscotti PT1H10M Serves 12 Ingredients: 0.5 Cup Vegetable Oil 1 Cup White Sugar 3.25 Cups All-Purpose Flour 3 Eggs 1 Tablespoon Baking Powder 1 Tablespoon Anise Extract Preheat the oven to 375 degrees. Grease cookie sheets with parchment paper. In a bowl, mix together flour and baking powder. In another bowl, add eggs, oil, sugar and anise flavoring and beat until well combined. Add flour mixture into the egg mixture and mix until a heavy dough is formed. Divide dough into 2 equal sized portions. Shape each portion into a long roll that will fit on the cookie sheet. Arrange 1 roll onto each prepared cookie sheet and with your hands, press down into 1/2-inch thickness. Bake for about 25-30 minutes or until golden brown. Remove from oven and place onto wire rack to cool. After cooling, slice each one into 1/2-inch slices crosswise. Arrange the slices onto the same cookie sheets and bake for an about 6-10 minutes per side.